This page provides you with Business Development resume samples that you can use for inspiration in writing your own resume, or for creating one through our easy-to-use resume builder. Below you'll find our how-to section that will guide you through each section of a Business development resume. Business development is a field that could have a few different job titles - including business development manager, business development associate, along with director and VP positions. It is a competitive field that requires a concise and impactful resume to get the job! And while you could easily sell a pen within 20 seconds and become the new “Wolf of Wall Street”, you are also aware that writing the best business development resume sample is a completely different story: as your job typically focuses on creating new partnership and marketing opportunities for a business, we will need to ensure that your resume focuses on the numbers and results. That’s just one of the tips we have given to many professionals like you, who have, after many years, finally been able to get the job they have always been dreaming of. We want the same for you, so let us inspire you and help you create the best resume! 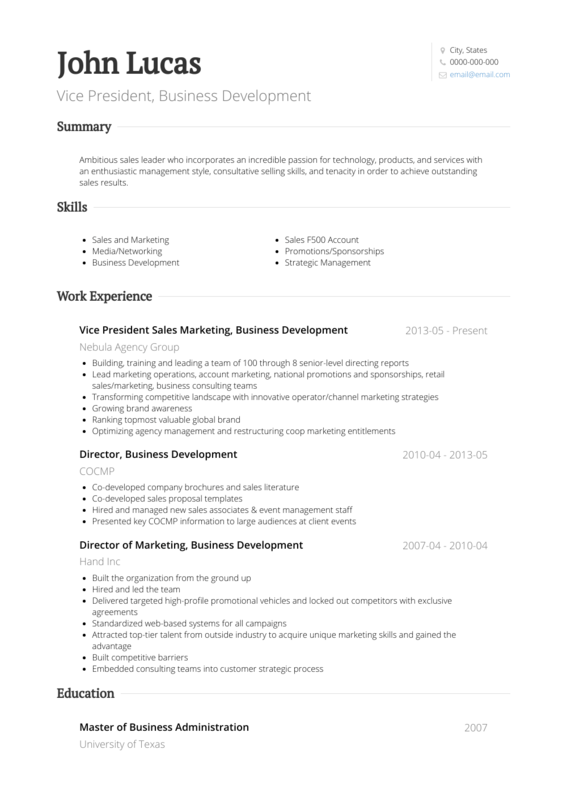 How to Write a Business Development Resume? Most individuals in the business development field possess an impressive mix of skills. They come from a variety of backgrounds, though have a business or sales history. Along with experience, business development professionals often bring their impressive list of contacts from one job to the next. Your resume should highlight your specific experience and focus on the best deals and partnerships you’ve created. To start with, use the reverse-chronological layout to highlight your strengths and to show your top achievements. Make sure you use clear and legible fonts and headings, allowing plenty of white spaces to create an enjoyable reading experience for the recruiter. Attention to detail and accuracy are two fundamental skills that employers would expect from professionals like you: please avoid typos or any other kind of mistake in your resume, they are sometimes lethal! Last, but not least: save your resume as a .pdf. Unfortunately, Microsoft Word is not the best software when it comes down to keeping your layout intact! You definitely know what a pitch is, so sit down and relax, because we need you at your best right now: in fact, the recruiter will have a quick look at this section and will determine whether you deserve a second look or not: this is your chance, and we don’t want you to blow it! Simply, this section answers that question you’ll definitely be asked at the interview: Tell me about yourself. Hats off to you, my friend: you might not believe us, but not very often recruiters get to this section of the resume, especially in your industry. As we mentioned earlier, make sure you use numbers, percentages and figures in this paragraph: as great as words are, recruiters need you to demonstrate measurable success! Our tips below have helped many business development professionals get to the next level. For more tips on writing the best work experience section, check out our detailed resume guide. Some may not agree with us, but we are strong believers that education does matter: why would you not want to mention your studies? They have molded you in the successful professional that you are right now, so make sure you bring those storytelling skills and tell the recruiter how important that period of your life was for your professional development. You could also include 3 or 4 college achievements that actually fit the current job description. We are fairly sure the recruiter will not be interested to hear about your part-time bartending gig, but we strongly suggest you include anything that could potentially be connected to your future success as a professional, not necessarily as a business development executive. With employers adopting new resume technology, it is essential to showcase your skills to ensure you pass the initial resume screen. Start by listing every single skill you have relating to your experience in business development. Please take your time on this personal brainstorming and make sure you include soft skills, hard skills, any professional skill at all. As a reminder, hard skills are job-specific and include all the knowledge you need to perform a job. Soft skills, on the other hand, are interpersonal skills. Ok, have you listed them all? All you have to do now is to match those with the skills list from the job description and add them to your resume. Say you are good at Microsoft Office package: this is not 1996! Finally, if you are looking for the best business development resume templates, you should check these masterpieces we have been working on here : many professionals like you have successfully used it to take their career to the next level.